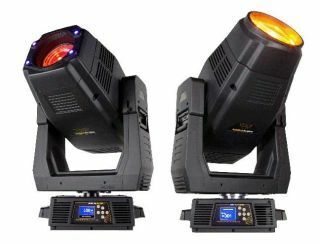 High End Systems will display their new SolaWash Pro 2000 and SolaSpot Pro 2000 at the LDI exhibition this week in Las Vegas from October 23 to 25. Both use bright white LED engine technology, and a 600 watt LED engine produces 35,000 lumens of output. The SolaWash Pro 2000 has two variable custom edge wash filters which produce varying degrees of soft edge light output. When variable wash is disengaged, the SolaWash Pro 2000 offers five degree beam at the narrow end. Together beam and wash provide 5.5 to 51 degree zoom. The SolaWash Pro 2000 also comes with a full field framing system. Additional features include CMY + CTO, two color wheels (one interchangeable) and an iris. Two rotating Gobo wheels, two fully retractable Animation wheels, two rotating Prisms, an Iris, a fixed color wheel and a CMY + CTO system are complemented by long throw optics designed to create sharp focus throughout the entirety of the 8 to 45 degree zoom range. Both fixtures also include High End Systems' thermal control software, making these fixtures quiet by default. "The launch of these new products in the SolaRange continues our aggresive introduction of cutting edge LED technology. Last year we released the SolaSpot Pro 1500 and a year later we are raising the bar once again,” Ferrante said. “Most exciting of it all is that we are not stopping there - and it is not just about products. Along with our partners we are building an incredibly strong team here at High End Systems and we cannot wait to see everyone at LDI this year." High End Systems also restructured its force: Eastern US Regional Sales Manager Sean Hoey, Western US Regional Sales Manager Ruediger Haeming, VP of Business Development Renaat De Wilde and APAC/Greater China RSM Jamie Boey are joined by Central US RSM Paul Hancock. Also on the team is HES veteran Bobby Hale in the key role of Business Development Manager, Fixed Installations.